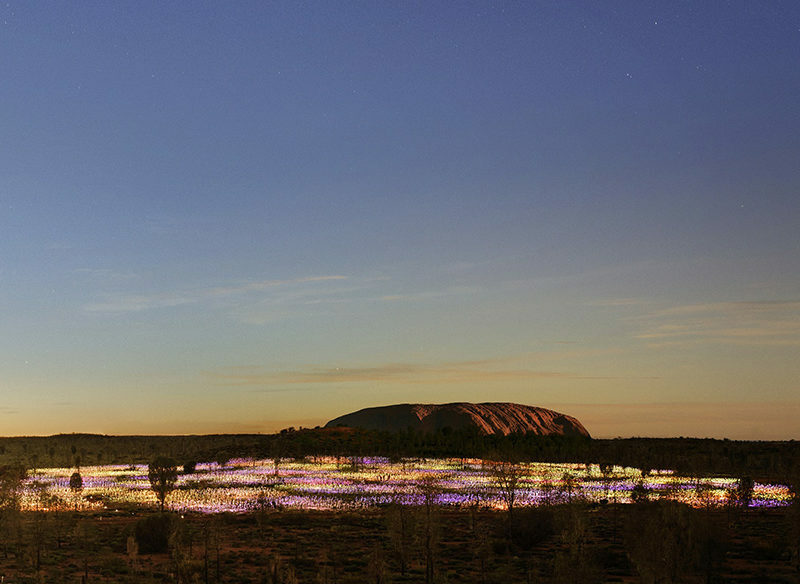 The ‘fear of missing out’ felt worldwide has eased, at least a little, as Bruce Munro’s Field of Light gets to sparkle for another year in Uluru’s biggest encore. It’s hard to put a finger on what makes internationally-acclaimed artist Bruce Munro’s Field of Light so affecting. It’s subtle and breathtakingly beautiful all at once. It overwhelms in size yet invites immersion in its fantasy garden of 50,000 ‘seeds’ of light; the spindly stems breathing and swaying through a sympathetic desert spectrum of ochre, deep violet, blue and white. 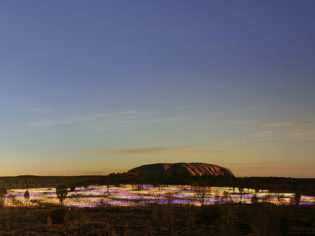 Field of Light flourishes from red dirt and tufts of spinifex, in the shadows of Australia’s most iconic monolith, Uluru: canvasses don’t come more visceral than this. This combination doesn’t just create art to look at; it creates a global phenomenon. It’s a sensation that has led Voyages Ayers Rock Resort to announce a once-in-a-lifetime encore performance. With more pulling power than the Rolling Stones, Field of Light – its fibre-optic fingers spread out across the space of four football fields – will ebb and flow through four more seasons until December 2020. Since its opening night in April 2016, visitors from around the world – art aficionados or not – have been irrevocably moved by the Field of Light. In Australia’s spiritual heartland, it’s hard not to be. In fact, it’s where Munro experienced the ‘feeling’ that tugged at his artistic heartstrings for more than two decades before bringing it to life in Uluru as ‘Tili Wiru Tjuta Nyakutjaku’ in local Pitjantjatjara (‘looking at lots of beautiful lights’). What he couldn’t have predicted as he sketched the idea into his notebook, while camping in Uluru in 1992, was the unprecedented demand his ‘swan song’ would create.